When dinosaur tracks are discovered in rock, it is best to leave them in place so they can be studied the way they were formed millions of years ago. Often someone wants to study a footprint, but cannot stay at the tracksite, or people want to learn about the track but it is located in a dangerous, dedicate, or difficult to reach place. 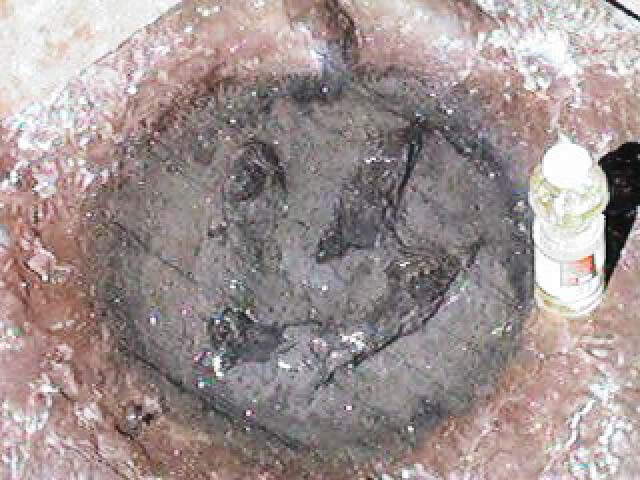 In these cases, a replica of the dinosaur track is made. If you are able to visit a place where real dinosaur tracks are located, then you may be allowed to make your own cast of the track to have as a permanent souvenir. 1. 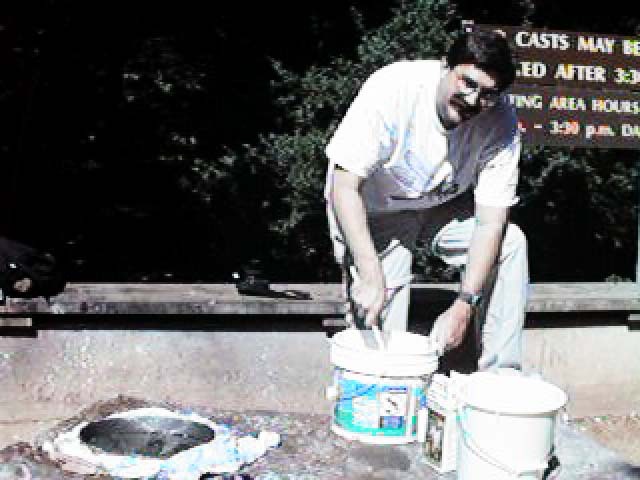 Preparation: It is important to get permission from the landowner before making casts of any dinosaur track to avoid doing damage to a fragile fossil. Choose a track made in relatively level rock to prevent loss of plaster during molding. The track should be cleaned out by sweeping dust and other dirt before beginning the cast process. 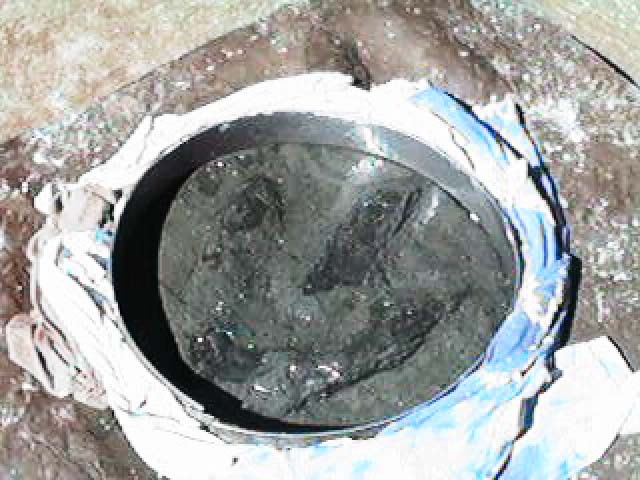 The dry surface of the track and surrounding rock must be lightly coated with petroleum jelly, cooking oil, liquid soap, or another nonstick material to prevent the cast medium from becoming stuck to the rock. Next, build a retaining wall or cardboard or posterboard or springform pan side surrounded by rags on the outside around the track to capture wayward plaster. The wall should surround the track a few inches away, be a few inches high, and also be coated with nonstick material. The wall can be sealed and secured to the rock using clay or modeling clay if there are large gaps. 2. 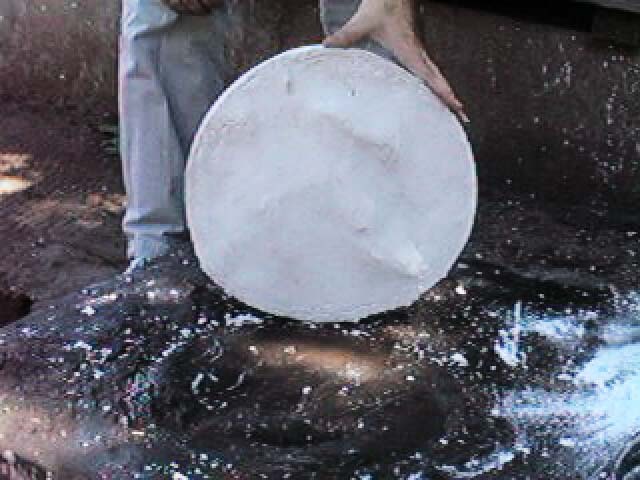 Cast Batter: Plaster of paris is the cast maker of choice because it is inexpensive and easy to use. As a guide, a foot-long track may engulf up to 10 pounds of plaster. Mix the plaster powder with fresh water using a ratio of two parts plaster to one part water until it is lump-free and resembles thick cream or cake batter in consistency Add a few drops of liquid detergent to discourage bubbles and enhance the smoothness. The next steps must be performed immediately so the plaster does not begin to set before it is poured. 3. Making the Cast: When casting a very large track, reinforce the cast with wire mesh, fabric such as cheesecloth, or even clean twigs placed in the middle of the plaster. Pour the plaster batter slowly and carefully into the prepared track, attempting to keep bubbles at a minimum, and filling all crevasses. While the plaster surface is still wet, use wet hands or trowel to smooth the top. Once the top begins to harden, it can be marked with the location, date, and caster (even a child's handprint). Let the plaster set for at least an hour, the longer the better. The process is faster when the weather is warm and dry. 4. Unveiling the Cast: Remove the retaining wall, rags, and attached clay. Lift the cast out of the track in a smooth motion. Be sure to record the details of the track: location, type of dinosaur, date of cast, and castmaker. Another interesting option for trackway casting is to use the dental casting material, Alginate, available from local or mail order dental supply companies. Alginate is supplied as a powder, in a choice of flavors! It is inexpensive, priced around $3 per pound, and very fast and easy to use. Equal amounts of water and powder, measured by volume, are squeezed together in a plastic freezer bag for one minute or less. The white paste is poured or squirted from a small hole in the plastic bag directly onto the track surface. 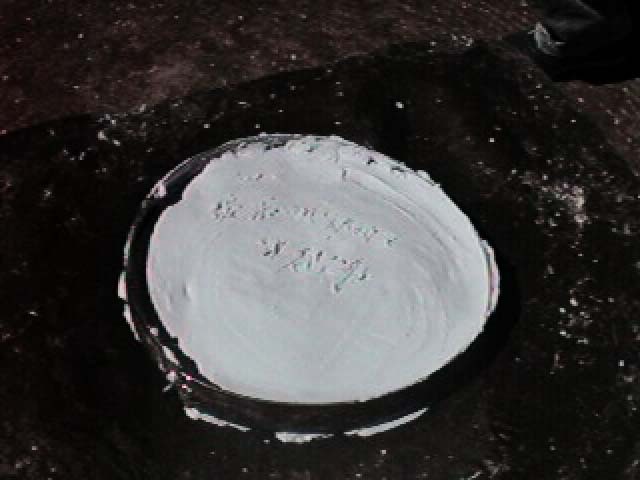 Within a few minutes, the Alginate dries to a flexible solid which may be removed from the track. The final cast is durable, but can be torn or cut.